It’s pretty common for some people to ask for less politics in games. Turns out, that’s not really possible, even if you’re just here to kill some zombies. This tweet from Naughty Dog creative director and The Last of Us Part II writer Neil Druckmann reaches the heart of the matter. It was in reply to a now deleted tweet asking that he keep“personal politics” out of the game. 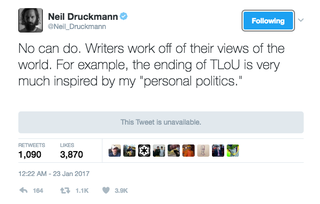 Druckmann’s reply is a good reminder that writing is based on personal experiences. Everyone has politics, even the dude who sends Drake on those swashbuckling adventures.